Flavor Text: Knowledge of the Eater of Souls comes at an unimaginable price. Reveal means all player see them. But if you have Forgotten Shoggoth (AtMoM) i think they have to guess. This is one of the better Tomes in the game. Yeah, it hurts that it's an Attachment, but it can replenish your hand almost immediately. If you get more than one use of this Tome, it's card advantage for the cost of 1, something you usually don't see outside of Miskatonic, let alone a big monster faction like Shub. Finally, the piece de resistance is how Book of Iod seeds your discard pile, a welcome feature in such a revival-centric faction. 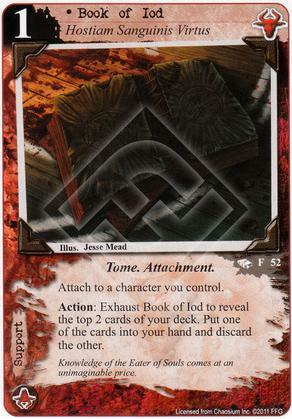 In any other faction, I'd give this card 4/5 stars, but Book of Iod comes in red, so I'm giving it 5 stars. The hardest part about the Book of Iod is keeping the character you attach it to alive. I have seen plenty of games where someone plays a Book of Iod and the other player immediately kills that charater via an event. Even so, that is probably the only thing making his card a probable 4 instead of a certain 5 to me. If your deck lets you reliably place it on someone with (T) and either toughness or invulnerability, then it is one of the truly strong cards. If it sits in play for just one Action window I think it has covered its cost. If it sits in plays for several rounds then you are likely to win. Card advantage is massive in this game and this card almost always delivers it in spades (or perhaps that should be in Shubs).